The Spinning Enhanced Visible and Infrared Imager (SEVIRI) is one of the instruments onboard Meteosat-9 satellite. SEVIRI delivers daylight images of the weather patterns with a spatial resolution of 3 km, plus atmospheric pseudo-sounding and thermal information. SEVIRI data help the weather forecaster in the recognition and prediction of dangerous weather phenomena such as thunderstorms, heavy rain, fog and explosive development of small but intense depressions, which can lead to devastating windstorms. The Airmass RGB Composite is one of the special coloured compositions that can be made from SEVIRI data. It was designed to monitor the evolution of cyclones and jet streaks (rapid wind streams). It allows to distinguish between the different types of clouds. Check out the latest Airmass image of Meteosat-9. 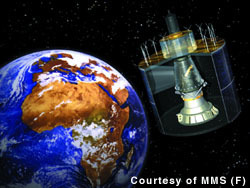 Launched on 21 December 2005, Meteosat-9 is the satellite which currently gathers weather data over Europe (together with Meteosat-8). In addition to the SEVIRI, Meteosat satellites carry the Geostationary Earth Radiation Budget (GERB) instrument, which provides data on reflected solar radiation and thermal radiation emitted by the Earth and atmosphere. Find more information about wheather satellites and interpretation of cloud images in this tutorial (EOEdu).